a lovely black sable female produced from our own carefully structured breeding program and is an excellent representation of the quality produced through our diligent breeding standards at Schraderhaus K9. 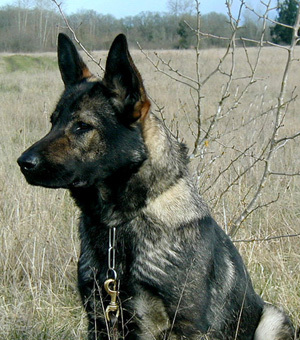 These lines are much sought after in working pedigrees, descendants of those East German Dogs we enjoy today, Dogs who were well known for producing impressive working progeny and were truly wonderful representatives of the working German Shepherd Dog. 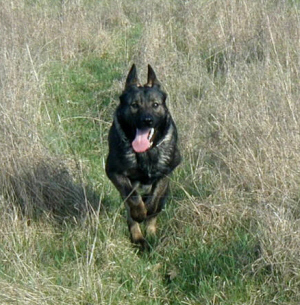 Barinja's sire, Faro Policia, is a World Renown Border Patrol Stud Dog, used as a 2 and 3 year old by the Czech Government as one of their 3 Best Producing Border Patrol stud dogs. These excellent producing stud dogs were used to produce working offspring for the protection of the country and Border Patrol monitoring, as well as for the strengthening and solidifying of the working characteristics and temperament of their future breeding stock. Faro is Rated Excellent, Breed Surveyed, Selected 1st Breeding Class, SVV1 Titled and the Winner of the Stud Dogs Show in Bratislavia in 2000 at only two years of age! Hips/Elbows 0/0 (Excellent). Faro has excellent working structure, with considerable head, extremely dark pigmentation, strong withers and solid back, as well as proper angulation. He has spacious movement that is low and effortless over the terrain. He is equipped with perfect character, highly developed prey and characteristic retrieve drives as well as excellent defense, and is diligent and fierce at protecting his territory against a strong threat. He has hard, committed grips and perfect obedience. Faro is also very good around children. 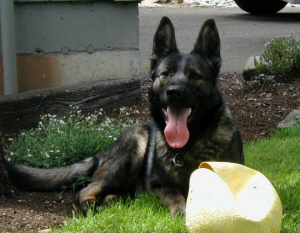 His bloodline contains some of the most noted DDR producers within the breed, along with Certified Border Patrol Dogs in his first second and third generations. 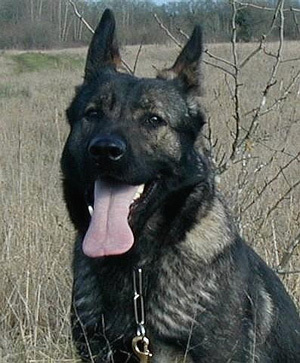 Faro's dam, Fatyma z Pohranicni straze-certified working Border Patrol Female, is one of the finest producing females of the past for the border patrol and has not produced dysplastic hips in her 8 year breeding career. 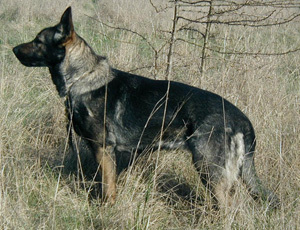 Barinja is the granddaughter of the Famous producing stud dog, Xero z Pohranicni straze A large-boned substantial female, Barinja is an excellent representative of her famous grandsire from the Pohranicni straze Border Patrol lineage. Barinja has a strikingly beautiful dark black sable coat with beautiful deep rich pigmentation. Her structure has great substance and she exhibits a solid and correct working structure as well as a temperament that is balanced and clear. She is good with children and other animals and has proven to be an excellent mother. Argo z Libocké zahrady, ZVV1, IPO1. 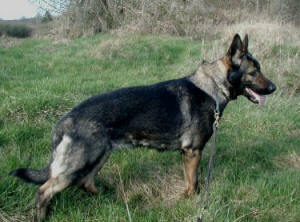 Barinja's first litter in 2005 was by Pure East German male Gradalen's Farox. Substantial in structure, Barinja's 8 pups were intelligent and quick to learn .These puppies were extremely dark in pigmentation in colors of solid black, bicolor, and black sable. showing beautiful and very strong head type. substantial in structure, Barinja's 2 males and 2 females were uniform and extremely strong and active immediately at birth. Pups were intelligent and quick to learn .These puppies were extremely dark in pigmentation in colors of black sable. with large and very strong head type. Barinja's puppies are very nice structurally, with high prey drive and clear minds....Temperaments are sure and outgoing.